"wAgAwAgA is experimenting with sound synthesizers, audio manipulation, live drums and instrumentation. styles ranging from dub, jungle, jazz, triphop, electronica. elements of eastern music and natural sounds find there way in also." "Grown in a lab in the depths of Hertfordshire. Big into dubstep and disinformation. Wonders often if there’s a difference between misinformation and disinformation. Incredibly lazy but prone to bouts of genius. 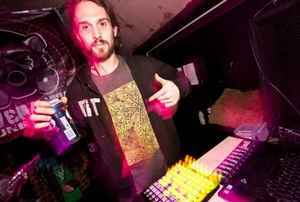 wAgAwAgA is essentially one man’s attempt to brain up the dubstep scene, taking on a broader set of influences than most(from Duke Ellington to Radiohead to Chris Morris to bedrooms) and twisting them into new and interesting shapes. Featured on Mary-Anne Hobbs in 2008 after a single release on Immigrant Recordings. Bits and pieces are slowly emerging on different formats, and eventually he’ll pull his finger out, get on the scene and start making a difference."